Description A warm salad makes the salad course intriguing again. Heat oven to 425°F. Toss pears with 1 tablespoon oil and spread evenly on rimmed baking sheet. Roast for 15 minutes, stirring to keep from sticking. Toss radicchio with another tablespoon of oil and salt; add to pan with pears and continue roasting for 8 minutes, until pears are slightly browned and radicchio is tender. Meanwhile, in small skillet warm together the remaining 3 tablespoons oil, vinegar and pepper. 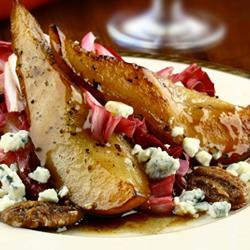 Remove radicchio and pears to large shallow bowl; toss with warm dressing and red onion. Serve immediately on salad plates, garnished with cheese, nuts and pepper.